Kuala Lumpur, 12 November 2018 – University of Illinois at Chicago (UIC) is Chicago’s largest university and it is the only public Research University located in the heart of Chicago, a global city with nearly 3 million residents. It is ranked as one of the most diverse and welcoming campuses in the United States with 4,558 international students from 99 countries out of 30,539 students and 12,664 faculty and staff. 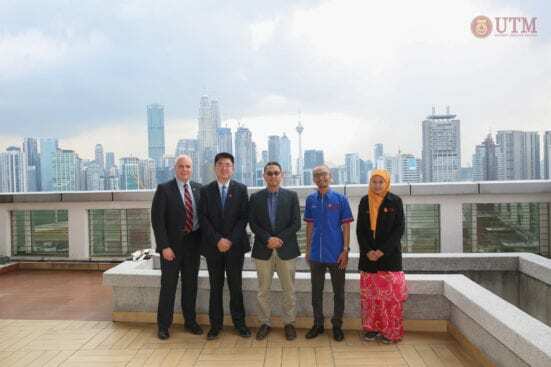 The UIC delegates visited UTM Kuala Lumpur and their presence consisted of Dr. Jeff Jianfeng; the Director and Mr. Christopher Biehl, the Associate Director from Programs for International Partnership. The aim of the visit was to look for possibilities for UIC and UTM to work together to develop a contract-based degree and non-degree programs for students who are interested in a global academic experience at a large urban institution. UIC introduced the Programs for International Partnership (PIP) that provides opportunities for students to complete the undergraduate studies or pursue graduate studies in variety of fields, including 3+2 Engineering Program, MPA and 3+2 Program in Public Administration. They feel that the contract program will allow students to experience the “best of both worlds” – both the Malaysian and American education models and provide the chance for exposure to a new way of learning, ideas and theories and increase global competence of students. UTM welcome this collaboration, but found it quite a challenge to be implemented in UTM, given that the UIC program fee for one semester is USD11,000. However, UTM sees the opportunity for short term training and student exchange program through official agreement and mutual collaboration which can be done together.